"War of the Reptile-Men!" Part 2 of 2. Script by Len Wein. Pencils by Ross Andru. Inks by Mike Esposito. Cover by John Romita and Frank Giacoia. It's a classic three-way Christmas confrontation! 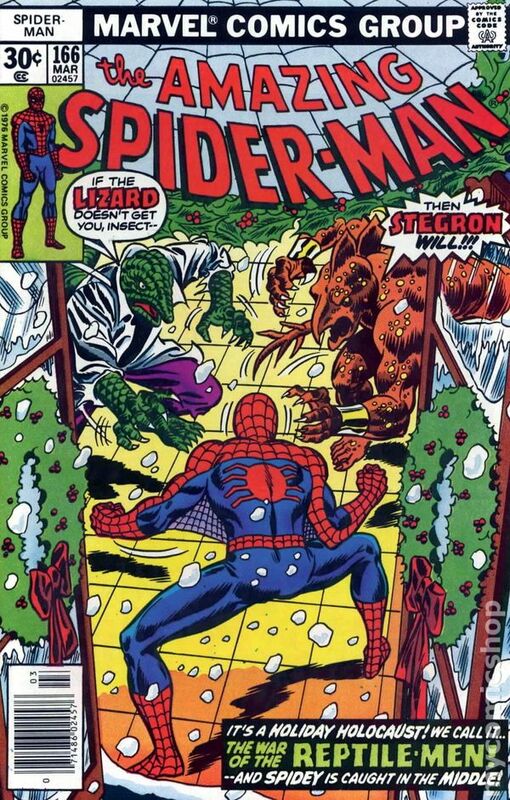 The Lizard vs. Spider-Man vs. Stegron! The key to victory for the web-slinger is to get the Lethal Lizard (aka Dr. Connors) to fight with him...instead of against him! But the Lizard usually just wants to kill Spidey! In snowy Central Park, the three combatants and a pack of dinosaurs come together for a Jurassic-style rumble! Is a Christmas miracle in the offing for your friendly neighborhood Spider-Man? An uplifting issue! Cameo appearances by Martha Connors, Billy Connors, J. Jonah Jameson, Dr. Marla Madison, Harry Osborn, Liz Allan, Flash Thompson, and Mary Jane Watson. (Notes: Stegron returns many years later in the Lethal Foes of Spider-Man (1993) Limited Series. The Lizard appears next in Spectacular Spider-Man 33 & 34.) Cover price $0.30. Mark Jeweler Advertisement Insert Variant. 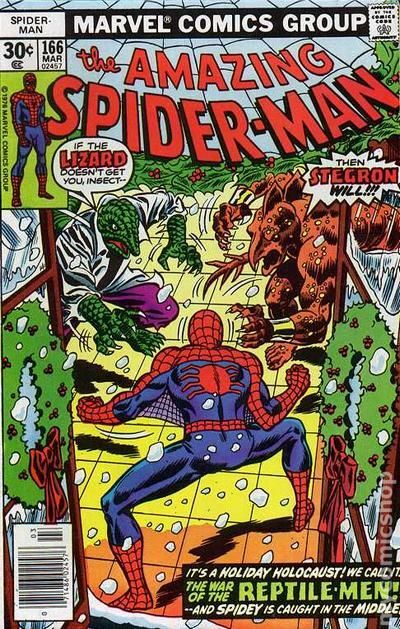 Stegron the Dinosaur Man is still hanging around--but now the Lizard is after Spidey, too! "War of the Reptile-Men!" Script by Len Wein, pencils by Ross Andru, inks by Mike Esposito. Cover price $0.30. Whitman Variant. "War of the Reptile-Men!" Part 2 of 2. Script by Len Wein. Pencils by Ross Andru. Inks by Mike Esposito. Cover by John Romita and Frank Giacoia. It's a classic three-way Christmas confrontation! 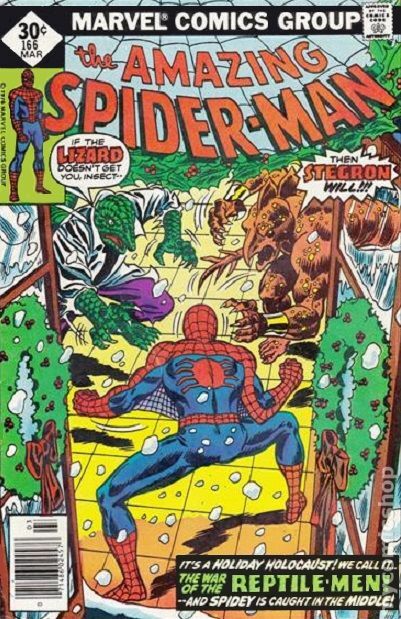 The Lizard vs. Spider-Man vs. Stegron! The key to victory for the web-slinger is to get the Lethal Lizard (aka Dr. Connors) to fight with him...instead of against him! But the Lizard usually just wants to kill Spidey! In snowy Central Park, the three combatants and a pack of dinosaurs come together for a Jurassic-style rumble! Is a Christmas miracle in the offing for your friendly neighborhood Spider-Man? An uplifting issue! Cameo appearances by Martha Connors, Billy Connors, J. Jonah Jameson, Dr. Marla Madison, Harry Osborn, Liz Allan, Flash Thompson, and Mary Jane Watson. (Notes: Stegron returns many years later in the Lethal Foes of Spider-Man (1993) Limited Series. The Lizard appears next in Spectacular Spider-Man 33 & 34.) Cover price $0.30.